The prestigious research and cultural organization, School for Advanced Research and Mesa Prieta Petroglyph Project are collaborating to present an afternoon talk by Polly Schaafsma titled Rock Art and Pueblo Shields: Symbolism and Change. Pueblo shields are a spectacular component of the pre-Hispanic rock art in the northern Rio Grande valley, including at Mesa Prieta, where they are found in large numbers. Focusing on their associated symbolism and functions in the landscape, brief comparisons will be made with historic shields, and the significance of the observed iconographic continuities and changes will be discussed. 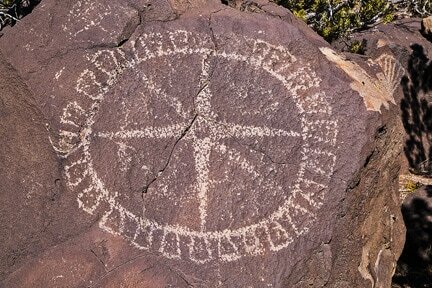 Polly Schaafsma is an American archaeologist, best known for her publications on Native American rock art. Schaafsma is a research associate in the Laboratory of Anthropology, Museum of New Mexico, Santa Fe, New Mexico. She and her husband, anthropologist Curtis F. Schaafsma, have published research on the origins of the prehistoric Katchina cult in what became the Southwest USA. Schaafsma is a frequent lecturer and instructor at rock art field seminars for the School for Advanced Research, the Museum of New Mexico, Crow Canyon Archaeological Center, and elsewhere. In 2008, Schaafsma received the Klaus Wellmann Memorial Award from the American Rock Art Research Association. The School for Advanced Research is located at 660 Garcia Street in Santa Fe. Admission is $5.00; the talk is free to MPPP affiliates and SAR members.